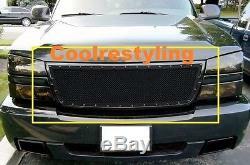 Chevy Silverado 1500 2500 3500 Black Wire Mesh Rivet Grille Insert. The quality of our products are guaranteed. This listing is for 06 Chevy Silverado 1500/05-06 2500/3500 Black Wire Mesh With Silver Rivet Stud Grille Insert 1pc. Replacement or Cut out grille, you may be required to cut your factory grille Apart first in order to install this grille insert. After you cut out your Factory Grille, you could not use your factory grille any more. We will provide the instruction sheet with your order. If you did not see my nice picture, just adjust your computer resolution setting, you would find my picture perfect! Thank you for your cooperation. The item "2006 Chevy Silverado 1500/05-06 2500/3500 Black Wire Mesh Rivet Stud Grille" is in sale since Wednesday, August 26, 2015. This item is in the category "eBay Motors\Parts & Accessories\Car & Truck Parts\Exterior\Grilles". The seller is "coolrestyling" and is located in Chino, California. Warranty: Not Including Plastic shell, Just insert only!